Which is Taller the Horseshoe Falls in Niagara Falls or the Rogers Centre? 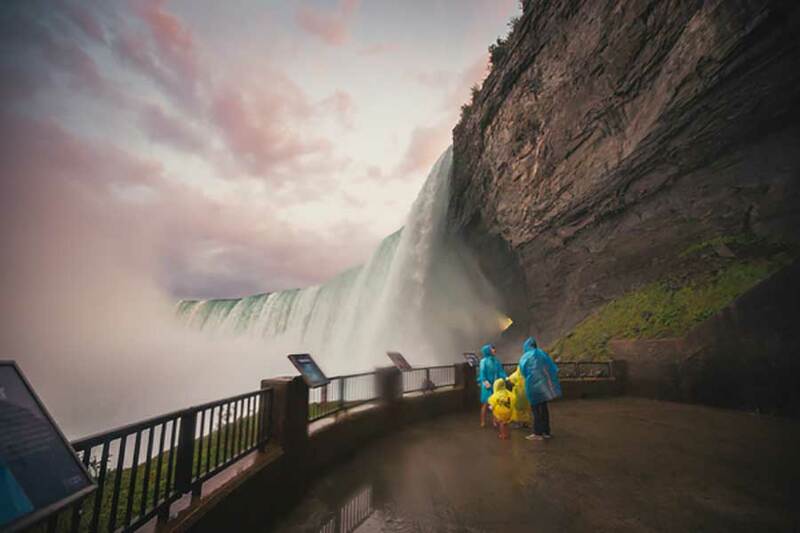 Spending time gazing at Niagara Falls is more than just a visual experience. The feel of the mist, the smell of freshwater air, the sounds of seagulls and the crowd all combine. Words like majestic, breathtaking, wondrous all fall short, as does our depth perception. Being so small in comparison, people often over-estimate the height of the Niagara Falls. If I asked you to guess, based on your memories, which would you say is taller: the Horseshoe Falls or, home of the Toronto Blue Jays, the Rogers Centre? If you guessed Rogers Centre, you’d be right. At 86 metres (282 feet) It towers over the Horseshoe Falls, which stands only 53 metres (174 feet) tall. Niagara Falls, which includes the Horseshoe Falls, American Falls, and Bridal Veil Falls, is one of the world’s best-known natural landmarks. Many believe it is one of the Seven Wonders of the World, but that list features man-made Wonders, such as the Pyramids at Giza. More recently, however, it has been included in a new list, the Seven Wonders of the Natural World, along side the Grand Canyon and Great Barrier Reef, for example. Before the Falls was used in hydro-electric power production, the water running over the brink ran as deep as ten feet high! Today it runs at about two feet, if you can believe it. Below the Falls, where the water pools, the water is a staggering 52 metres (170 feet) deep, which, if you’ve been paying attention, is only one metre less than the Falls are tall! About 2.2 million litres (600,000 gallons) of water goes over the Horseshoe Falls every second. In a minute you could fill about 55 Olympic-sized swimming pools with all that water. Considering the courage and training needed by high-wire walker Nik Wallenda to cross the Falls a few years ago, it’s surprising to learn that Annie Edson Taylor, the first person to survive going over the Falls, was far from a professional daredevil. On her 63rd birthday, this American schoolteacher, journeyed over the Falls in a wooden barrel and lived to tell the tale. Even more surprising, so did her cat; legend says, it came out white, though it went in black! Though Annie Edson Taylor lived to brag about it for the next 20 years of her life, numerous more did not survive the plunge. Modern day attempts are highly illegal, and those lucky enough to live are prosecuted. According to Wikipedia, there is at least one instance of a tourist below in the Cave of the Winds being injured after getting struck by a salmon passing by in mid-air. Each and every night of the year, the Falls are illuminated in an array of colours by a lighting system based on the Canadian side. The colours are often set to commemorate holidays, historical events, as well as honour important causes such as the fight against cancer. The horseshoe shape of the Canadian Falls was formed by erosion from so much water pouring over, nonstop. In fact, the horseshoe shape deepens about three-quarter of a metre (two-and-a-half feet) each year. Prior to hydro-electric production, the Falls were eroding at a much faster pace. This is just a sampling of all the interesting facts and figures about Niagara Falls. Come see for yourself how this Natural Wonder feels larger than life! For your convenience, Holiday Inn by the Falls is located a short walk to the Falls and its popular attractions. Email: (required) Will not be published.